Recent years have seen rising interest in improving post-disaster research, with calls for more and better studies coming from the academic community and agencies such as the National Institutes of Health. Although understanding the wide-ranging effects of disasters is vital for an effective public health response, a lack of baseline data has made it difficult to attribute post-disaster changes in environmental conditions to the impacts of disasters. In a new study published in the journal PLOS One, Jennifer Horney, PhD, associate professor and head of the Department of Epidemiology and Biostatistics in the Texas A&M School of Public Health, along with researchers from Texas A&M and the Pacific Northwest National Lab, examined concentrations of polycyclic aromatic hydrocarbons (PAHs) before and after Hurricane Harvey in the Houston environmental justice neighborhood of Manchester. Manchester, which is located near refineries and other industrial sites along the Houston Ship Channel, is a predominantly Hispanic neighborhood where residents face disproportionate health risks due to pollution and other environmental hazards. As disasters become more frequent and populations living in vulnerable areas increase, interest in the health effects of exposure to the combination of natural and technological disasters has grown. Flooding and disaster-related equipment failures can lead to far greater exposure to environmental health risks. In this study, Horney and colleagues focused on PAHs, which are a product of combustion from human activities such as petroleum consumption in transportation or natural processes such as wildfires. Since 2016, researchers from Texas A&M and the Texas Environment Justice Advocacy Services (TEJAS), along with neighborhood residents, worked to collect data on resident's domestic exposure to PAHs by collecting and testing household dust. One week after Hurricane Harvey made landfall, researchers revisited 25 homes to collect and test soil samples. "This project was only possible due to the ongoing partnership between Texas A&M, residents of Manchester, and community group TEJAS, who contacted us after Hurricane Harvey to return to Manchester to collect samples," Horney said. Hurricane Harvey, which made landfall in late August 2017, brought more than 64 inches of rain to the Houston area, flooding 200,000 homes, 13 Superfund sites and more than 800 wastewater treatment facilities. In the laboratory, researchers extracted organic compounds from the pre-Harvey dust and post-Harvey soil samples and analyzed them using gas chromatography. Horney and her colleagues found evidence that flooding had redistributed PAHs in Manchester. Sites with higher PAH concentrations before the storm had lower concentrations afterward, and the opposite was true for sites with lower pre-hurricane PAH concentrations. However, the source of PAHs was consistent in samples from before and after Hurricane Harvey. "Although this study was small, the unique ability to compare pre- and post-hurricane samples helps further our understanding of molecular changes following disasters," said Horney. 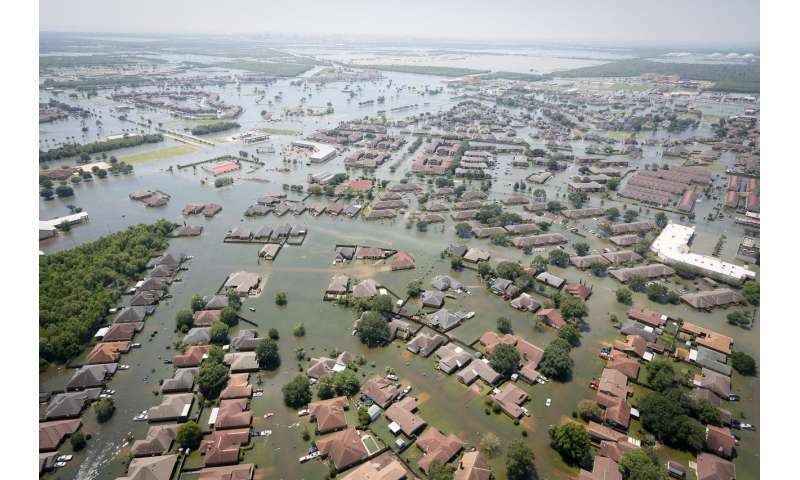 "Gaining insight into how disasters like Hurricane Harvey can redistribute contaminants will help public health and emergency management personnel understand which areas are at greater risk during disasters, allowing for first responders and residents to take protective actions." Water, the great social equalizer. No matter what hill above the rest you live on, water will bring you low to the rest of us. You can never escape nature's fairness. The lesson: be fair from the start. No superfund sites in residential areas. All info on contents public accessible, exactly what the Bush Bunch destroyed. Fund these from the federal gov so no hanky-panky has to happen when the corporates try to duck their share of the costs by deception.